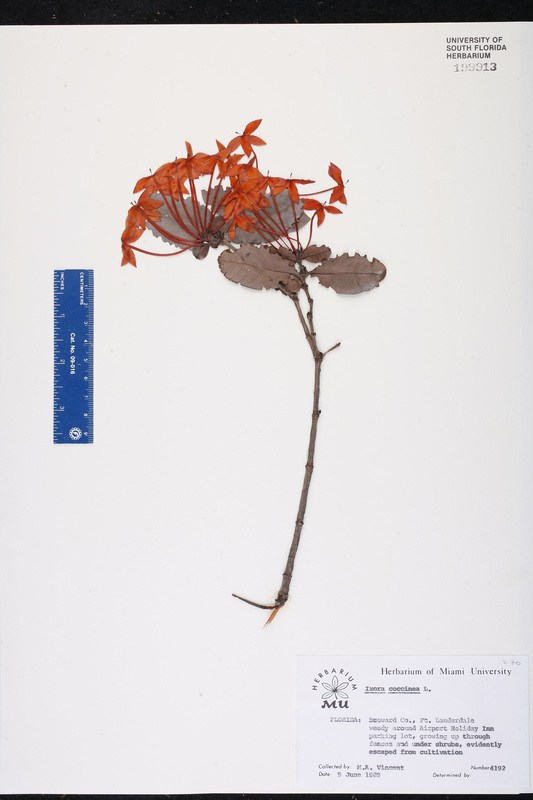 Citation IXORA COCCINEA Linnaeus, Sp. Pl. 110. 1753. Type: INDIA: Kerala: Without data (lectotype: Rheede, Hort. Malab. 2: t. 13. 1679). Lectotypified by Fosberg & Sachet, Taxon 38: 488. 1989. 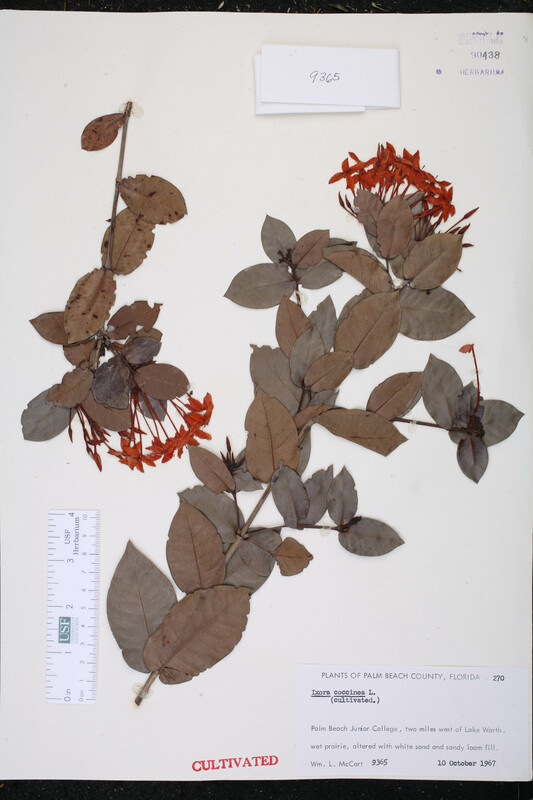 Ixora coccinea var. 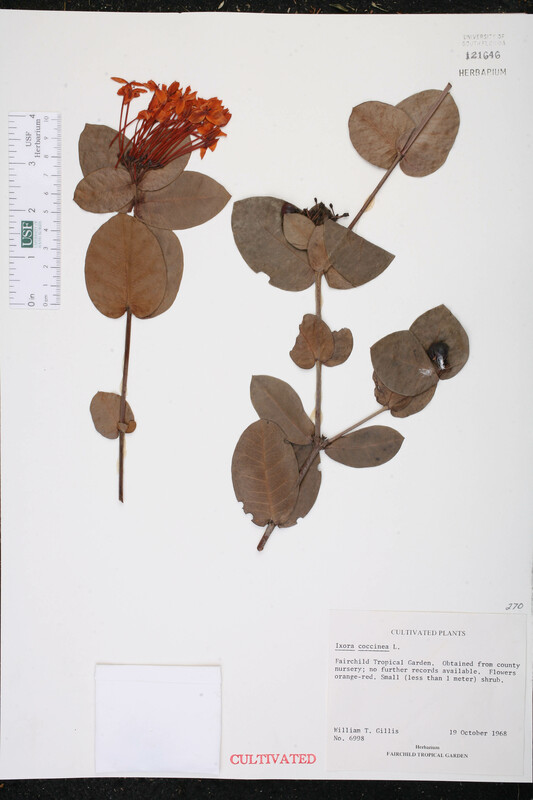 linneana Ixora coccinea Linnaeus, var. linneana Kurz, J. Asiat. Soc. Bengal. 46(2): 148. 1877, nom. inadmiss. 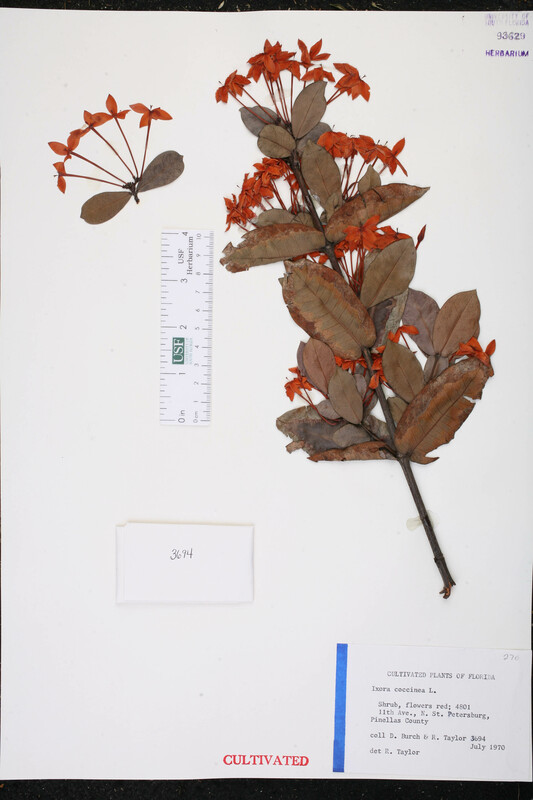 BASIONYM: Ixora coccinea Linnaeus 1753. Ixora chelsonii Ixora chelsonii Van Geert, Nursery Cat. (Auguste Van Geert) 78: 15. 1879. 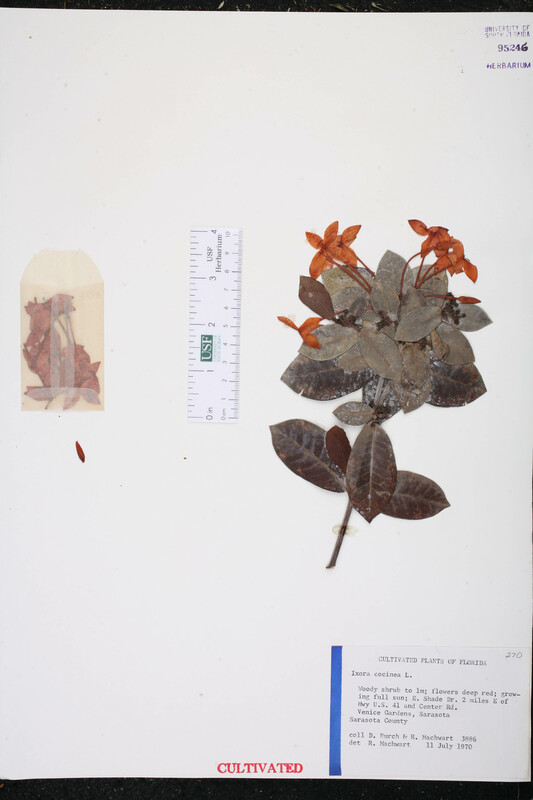 Ixora coccinea forma lutea Ixora coccinea Linnaeus, forma lutea (Hutchinson) Fosberg & Sachet, Baileya 23: 79. 1989. 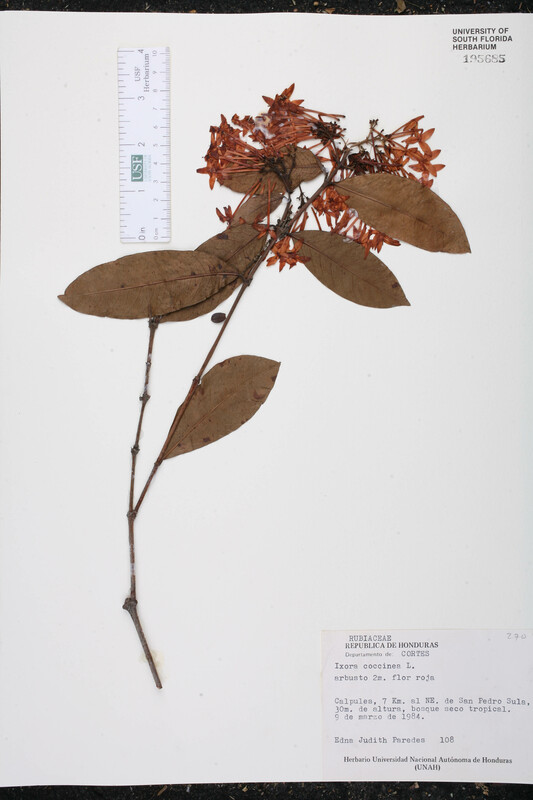 BASIONYM: Ixora lutea Hutchinson 1912. 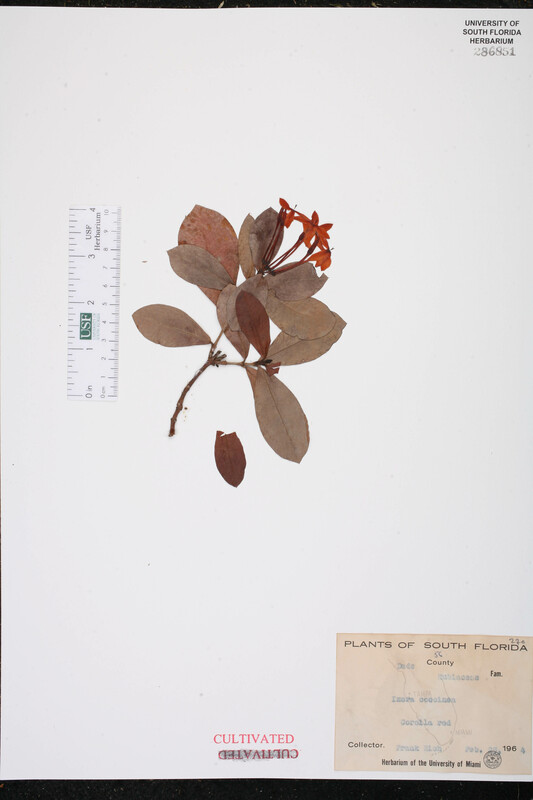 Ixora coccinea var. 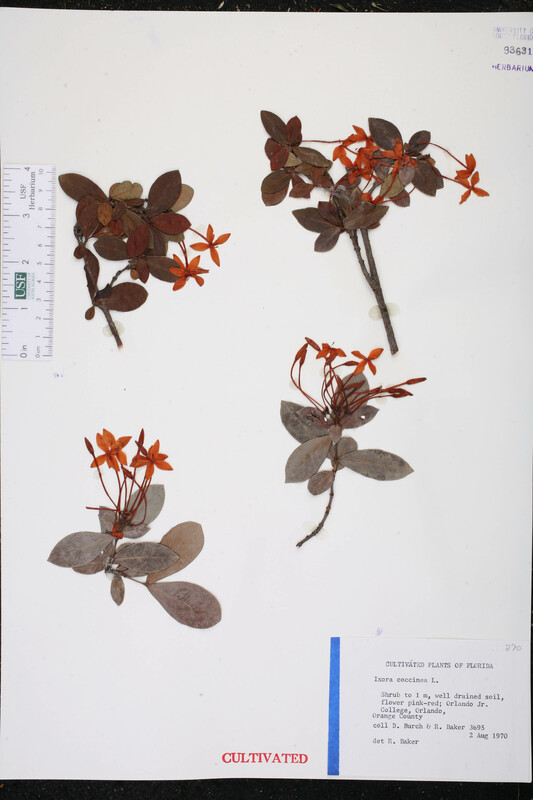 aureorosea Ixora coccinea Linnaeus, var. aureorosea Corner, Gard. Bull. Straits Settlem. 11: 186. 1941. 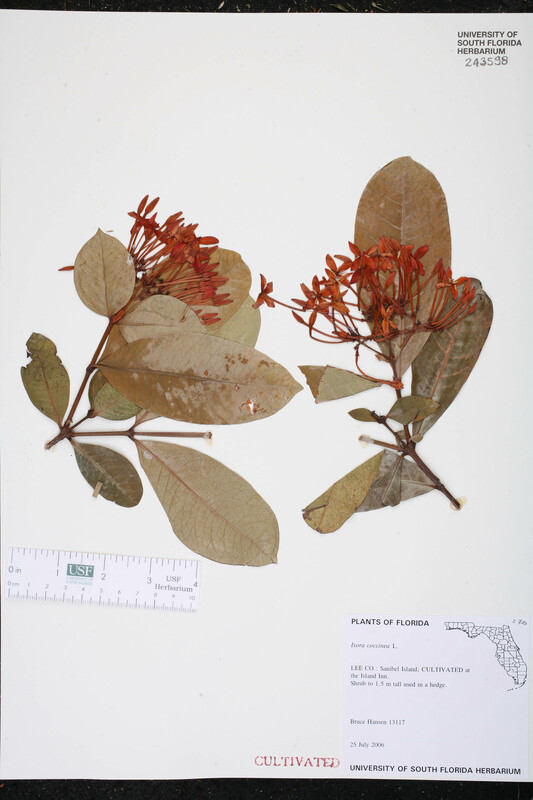 Ixora coccinea var. 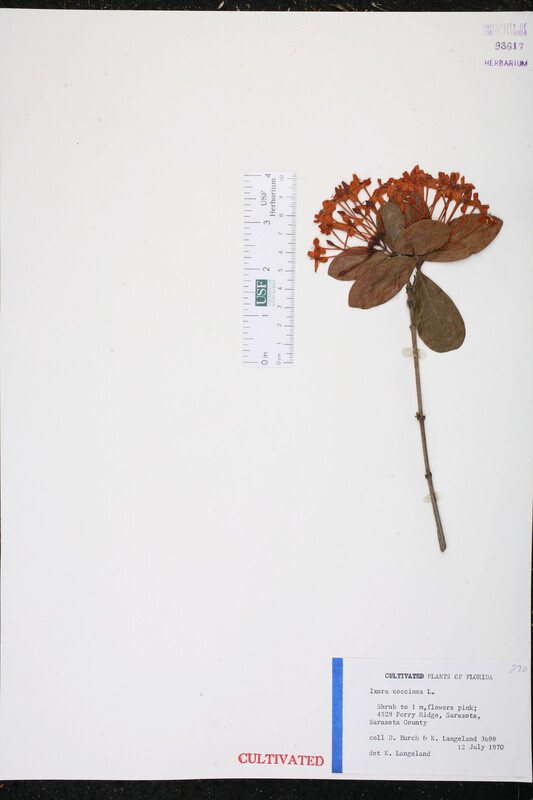 bandhuca Ixora coccinea Linnaeus, var. bandhuca (Roxburgh) Kurz, J. Asiat. Soc. Bengal 46(2): 148. 1877. 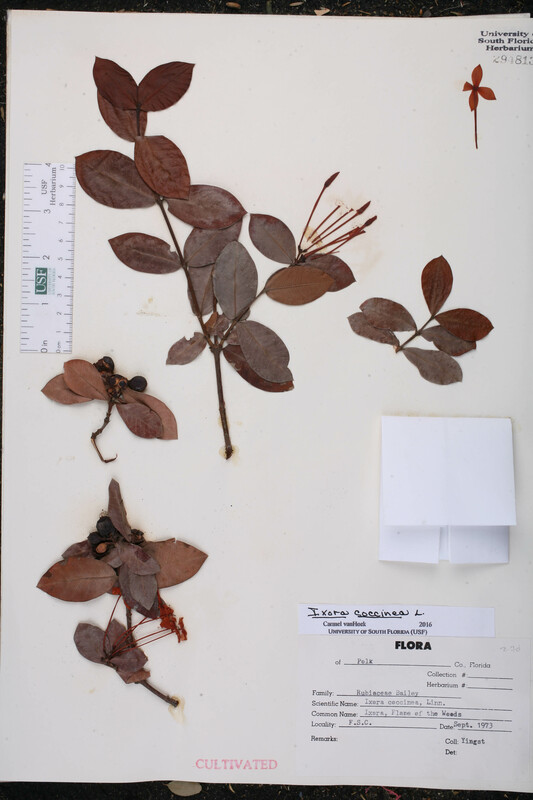 BASIONYM: Ixora bandhuca Roxburgh 1820. 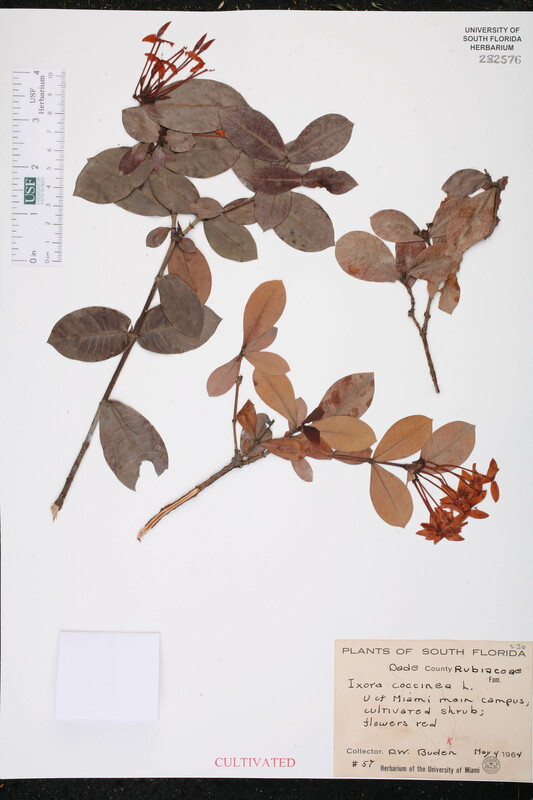 Ixora coccinea var. 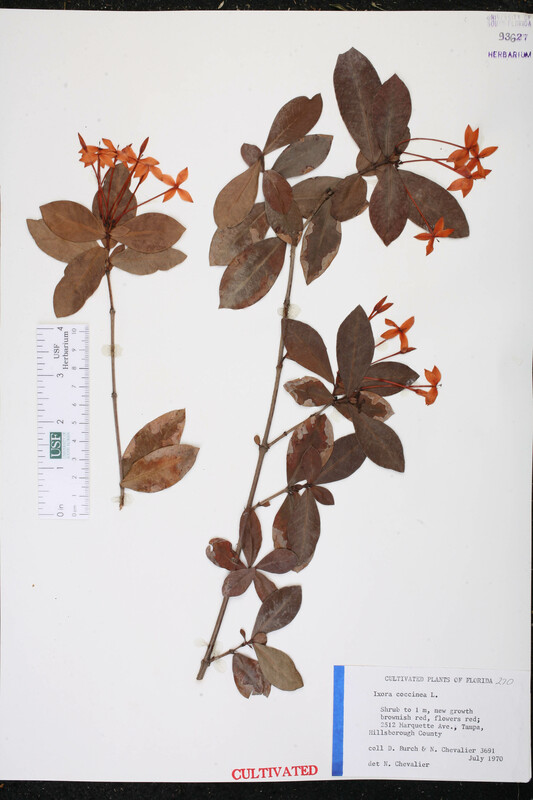 decolorans Ixora coccinea Linnaeus, var. decolorans Corner, Gard. Bull. Straits Settlem. 11: 186. 1941. Ixora coccinea var. 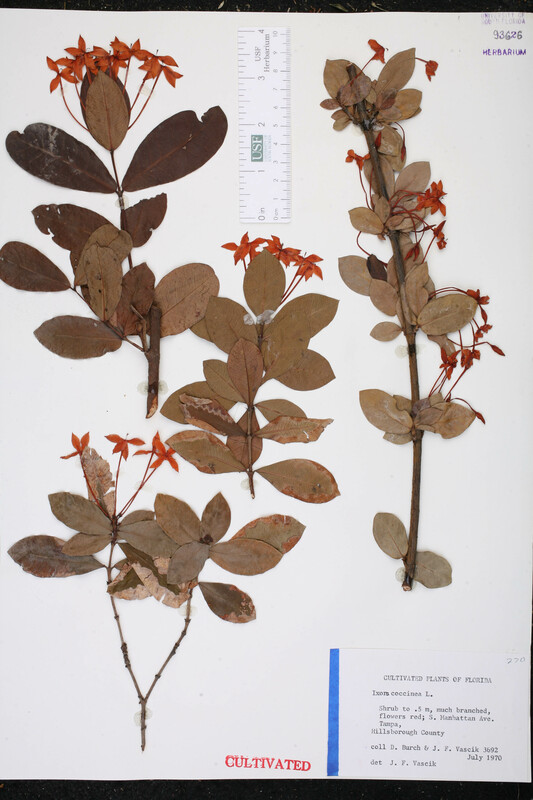 hermannii Ixora coccinea Linnaeus, var. hermannii Fosberg & Sachet, Baileya 23: 79. 1989. TYPE: SRI LANKA: Matale Distr., Sigiriya Tank, 15 Jul 1973, Nowicke et al. 363 (holotype: US). 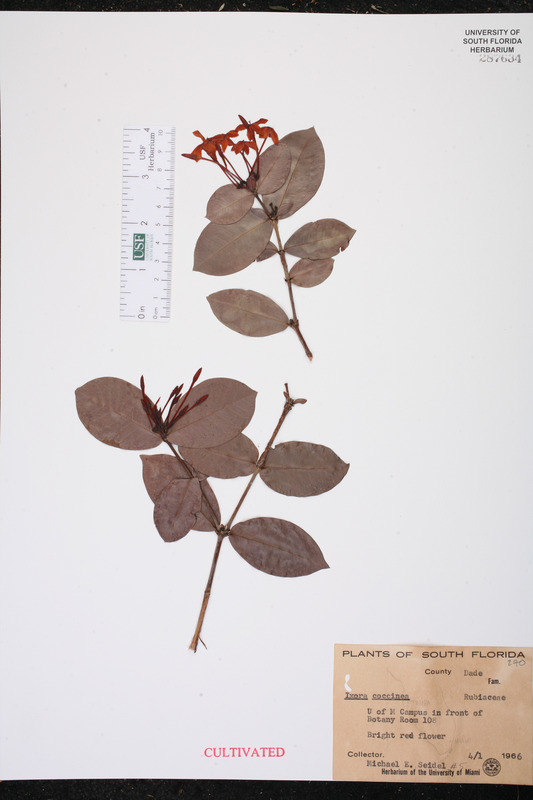 Ixora coccinea var. intermedia Ixora coccinea Linnaeus, var. intermedia Fosberg & Sachet, Baileya 23: 80. 1989. TYPE: VIRGIN ISLANDS: St. Croix: Cult. at Teague Bay, s.d., Fosberg 55279 (holotype: US). 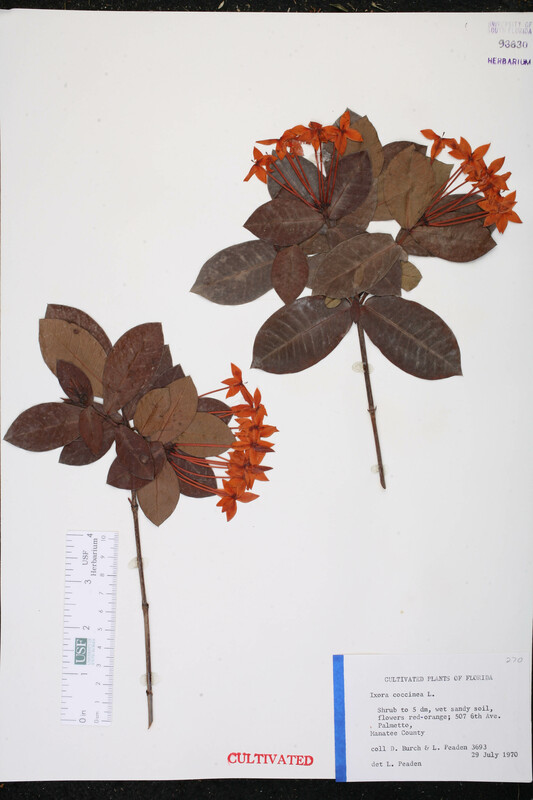 Ixora coccinea var. lutea Ixora coccinea Linnaeus, var. lutea (Hutchinson) Corner, Gard. Bull. Straits Settlem., ser. 3. 11: 186. 1941. 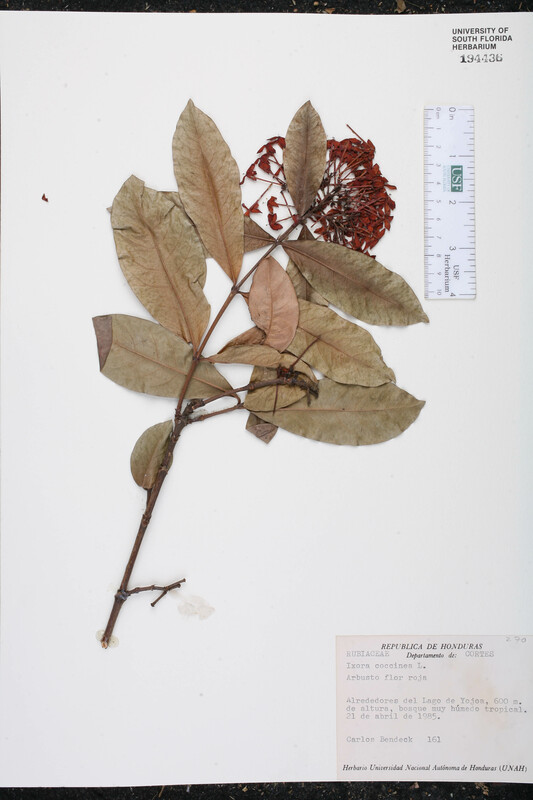 BASIONYM: Ixora lutea Hutchinson 1912. 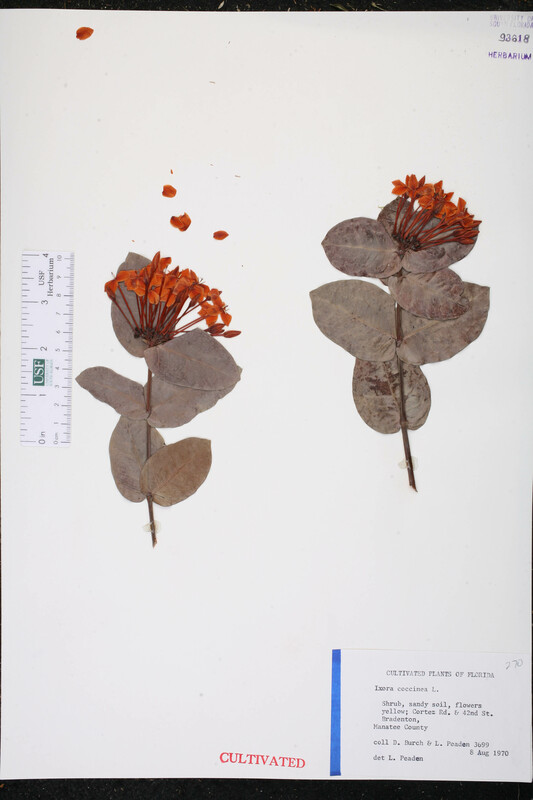 Ixora coccinea var. 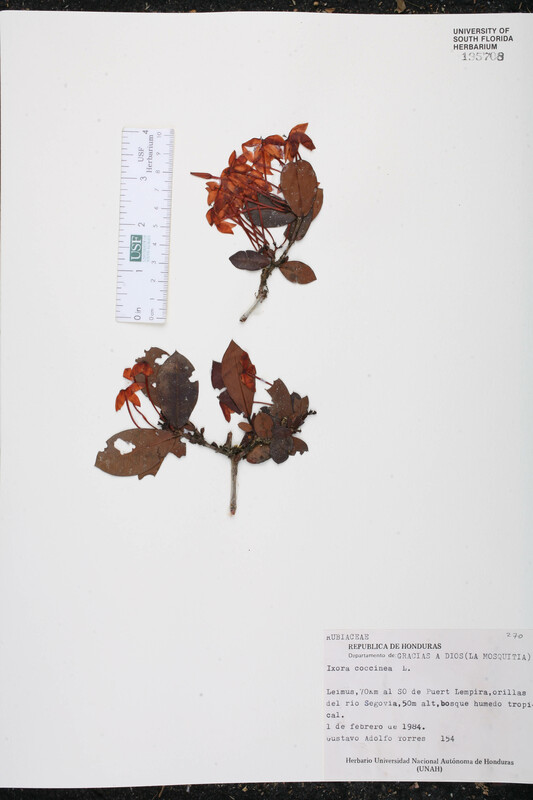 rosea Ixora coccinea Linnaeus, var. rosea Corner, Gard. Bull. Straits Settlem. 11: 186. 1941. Ixora flora-lutea Ixora flora-lutea Dreer, Nursery Cat. (Dreer) 1904(Wholesale): 34. 1904. Ixora fraseri Ixora fraseri R. B. Postans, Gard. Chron., ser. 2. 2: 83. 1874. Ixora grandiflora Ixora grandiflora Loddiges, Bot. Cab. 4: pl. 314. 1819, non Ker Gawler 1817..
Ixora incarnata Ixora incarnata (Blume) de Candolle, Prodr. 4: 486. 1830, non Roxburgh ex Smith 1811. 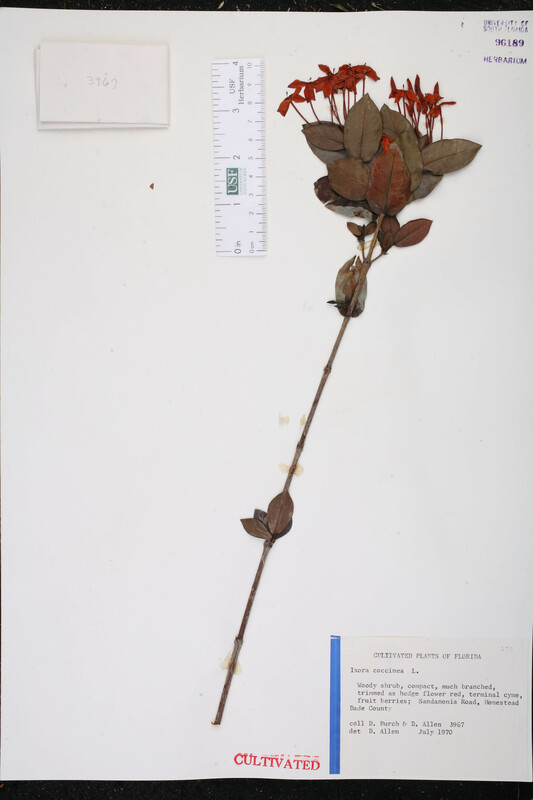 BASIONYM: Pavetta incarnata Blume 1826. Ixora lutea Ixora lutea Hutchinson, Bot. Mag. 138: t. 8439. 1912. 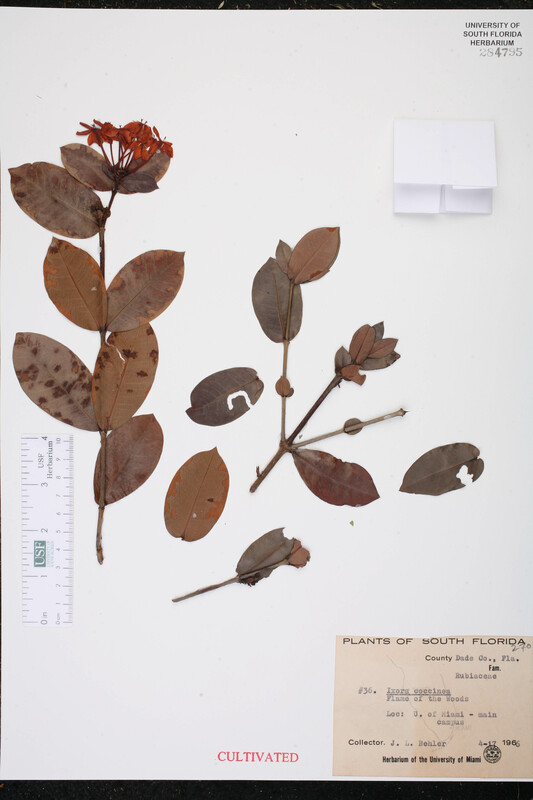 Ixora montana Ixora montana Loureiro, Fl. Cochinch 76. 1790. Ixora profusa Ixora profusa Van Geert, Nursery Cat. (Auguste Van Geert) 78: 15. 1879. 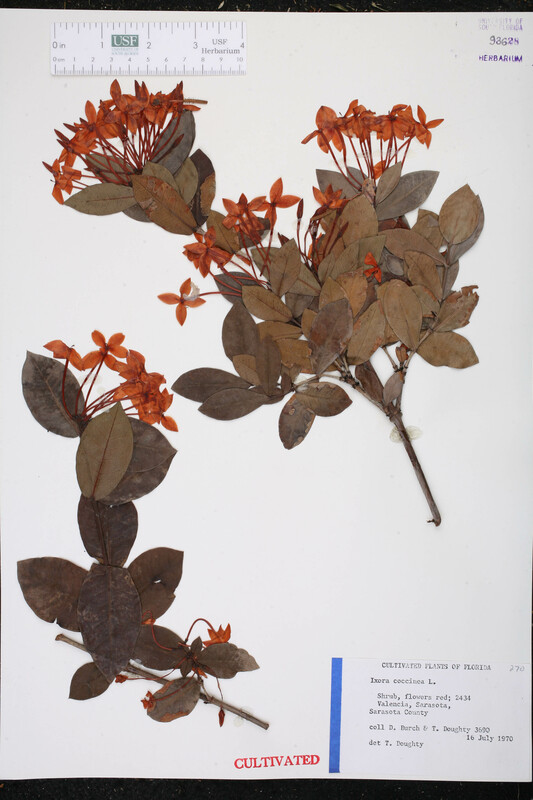 Ixora propinqua Ixora propinqua R. Brown ex G. Don, Gen. Hist. 3: 570. 1834. Ixora shawii Ixora shawii J. Neumann, Möller's Deutsche Gärtn.-Zeitung 45: 183. 1930. Ixora thomeana Ixora thomeana (K. Schumann) G. Taylor, in Exell, Cat. Vasc. Pl. S. Tomé 206. 1944. 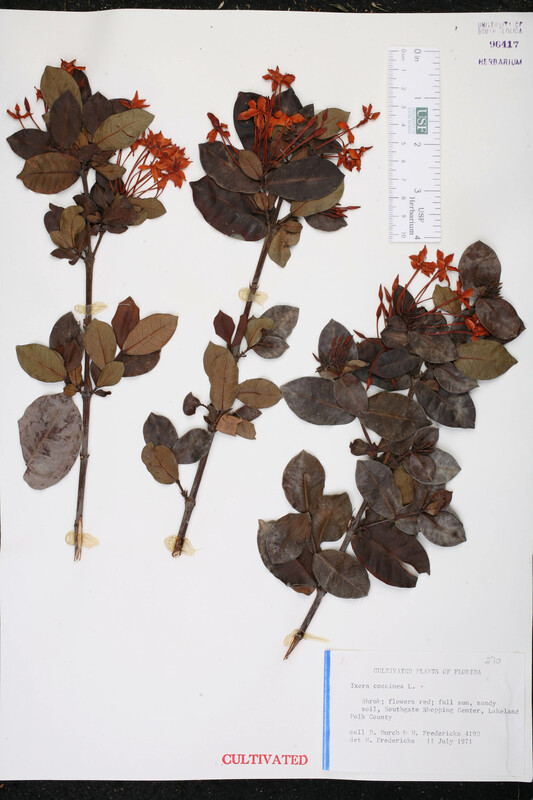 BASIONYM: Ixora radiata Hiern, var. thomeana K. Schumann 1893. Pavetta bandhuca Pavetta bandhuca (Roxburgh) Miquel, Fl. Ned. Ind. 2: 266. 1857. 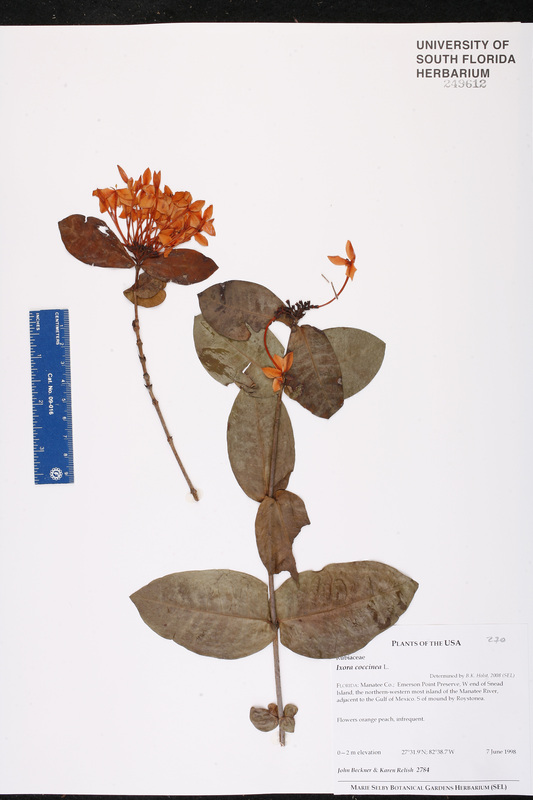 BASIONYM: Ixora bandhuca Roxburgh 1820. Pavetta incarnata Pavetta incarnata Blume, Bijdr. 950. 1826. USA Florida Miami-Dade Co. 17 Apr 1966 J. L. Behler 36 CULTIVATED. USA Florida Miami-Dade Co. 25 Feb 1964 F. Rich 56 CULTIVATED. USA Florida Miami-Dade Co. 04 May 1964 D. W. Buden 57 CULTIVATED. USA Florida Manatee Co. 08 Aug 1970 D. Burch 3699 CULTIVATED. USA Florida Polk Co. 11 Jul 1971 D. Burch 4192 CULTIVATED. USA Florida Sarasota Co. 12 Jul 1970 D. Burch 3698 CULTIVATED. USA Florida Miami-Dade Co. Jul 1970 D. Burch 3967 CULTIVATED. USA Florida Orange Co. 02 Aug 1970 D. Burch 3695 CULTIVATED. USA Florida Pinellas Co. Jul 1970 D. Burch 3694 CULTIVATED. USA Florida Lee Co. 26 Jul 2006 B. F. Hansen 13117 CULTIVATED. USA Florida Manatee Co. 29 Jul 1970 D. Burch 3693 CULTIVATED. USA Florida Hillsborough Co. Jul 1970 D. Burch 3692 CULTIVATED. USA Florida Hillsborough Co. Jul 1970 D. Burch 3691 CULTIVATED. USA Florida Palm Beach Co. 10 Oct 1967 W. L. McCart 9365 CULTIVATED. USA Florida Miami-Dade Co. 19 Oct 1968 W. T. Gillis 6998 CULTIVATED. 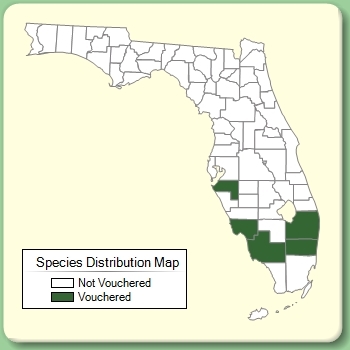 Obtained from county nursery; no further records available. USA Florida Sarasota Co. 16 Jul 1970 D. Burch 3690 CULTIVATED. USA Florida Sarasota Co. 11 Jul 1970 D. Burch 3886 CULTIVATED. USA Florida Miami-Dade Co. 01 Apr 1966 M. E. Seidel 5 CULTIVATED.